Don’t you some times get bored of the “standard’ engagement shots you see out there? Lets go to a park, hugging picture, kissing picture, maybe a dip… You show the pictures to your friends and they will say “oh you guys look so cute”, and think to themselves “looks exactly like Susi’s engagement photos”. Lets spice it up, shall we? You put so much thought into your wedding, why not spend a bit of time with us coming up with a fun and different concept for your engagement shoot? Something where people look at and say “yeah, that is SO you”. There is a reason Vancouver is bustling with movie sets, we have so many options to be creative, urban settings, lush rain forests, mountains, high end, grungy, you name it. Lets take Jojette “Jo” Calibo and David Buchholz, for example. Jo and David are avid gamers. In fact, they met in a video game – imagine that (Funny enough, they are not the only one of “our” couples this year that met in a game – seems to be “a thing”?). Both of them are also big fans of fantasy role-playing games. 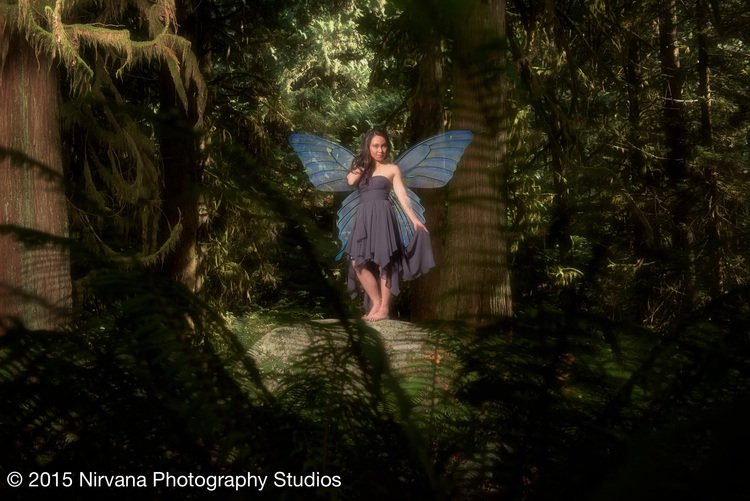 Jo specifically loves fairies and pixies, her gamer name is “Winter Pixie”, and thinks of David as her knight, so… why not incorporate that into their engagement shoot? We created several sessions around the theme. 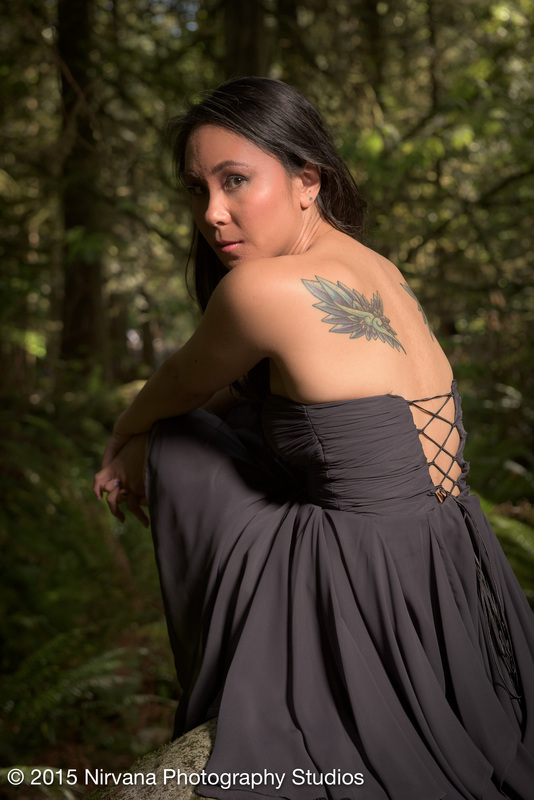 For this one, we wanted to show Jo as a forest fairy, and went to Lynn Canyon, make-up artist in tow. Ahead of time, we had selected the proper outfit and locations. 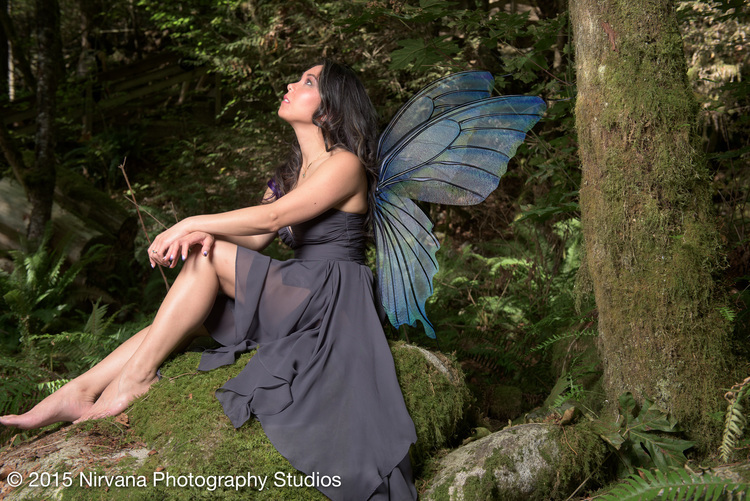 No need for fake wings – Jo brings her own in the form of a fairy-wing-tattoo.